When the actual box office numbers were counted Monday, Dolly's film Joyful Noise fell a little further than was originally expected. Instead of the No. 13 in the weekend estimates, the project actually came in at No. 14 with a gross of $3,188,393, bringing its cumulative total to $26.68 million. It made its estimated No. 12 position Saturday and No. 14 Friday but came in at No. 15 Sunday instead of the estimated No. 14 spot. A couple of communities were celebrating Dolly's Imagination Library this week. In Mendocino County, Calif., folks were handing out their 50,000th book in the literacy program, which The Record-Bee reported on here, and in Illinois, TribLocal reported here about the program's third anniversary locally in Elgin. In its third weekend at the cinema, Dolly's new film Joyful Noise dropped out of the top 10, as was expected with three new movies opening in wide release plus several Oscar nominees gaining audiences as a result of their award prospects. The movie slipped from No. 7 for the week down to No. 13 for the weekend with an estimated $3.24 million gross for the three days. This brings the total in box office receipts to $26.7 million, with $850,000 estimated and 14th place on each Friday and Sunday and $1.54 million and 12th place on Saturday. The film also lost a quarter of its theaters and is now showing at 2,021 screens nationwide. Dolly's Better Day falls two but remains in the top 10 for a 22nd week on the British country music chart, it was announced Sunday. The CD comes in at No. 9 country albums in the U.K., while Dolly: Live From London falls off the 20-position country compilations list, down from No. 18 last week, its 97th there. Norah Jones' group, The Little Willies' For The Good Times, with their cover of Dolly's "Jolene," slips one to No. 4 country in its third U.K. week. In Australia, The Very Best Of Dolly Parton, Volume 1 drops seven to No. 14 country in its 99th week Down Under and loses six spots to No. 25 pop catalog albums in its 26th week there. Dolly is Kenny Rogers' favorite singing partner, he tells The Miami Herald. Check out the story here. Thanks, Todd! Dolly's Joyful Noise movie wrapped up its second full week on Thursday with a return to seventh place gross with ticket sales of $431,219. That brought its weekly total to seventh place at $7.66 million. Since release, its cumulative gross is $23,487,510. With several new films opening Friday, it is unlikely to remain in the top 10 this weekend. The Joyful Noise Soundtrack hits its previously-announced No. 12 spot on the all-genre pop albums chart for Feb. 4 released in full by Billboard magazine on Thursday, rising from its No. 21 debut thanks to second-week sales. The title also rises eight places to No. 12 current albums, holds onto the No. 1 soundtracks spot for a second week, gains one to No. 1 Christian albums, slips one to No. 2 gospel albums, loses one to No. 3 independent albums, moves up three digits to No. 8 digital sales albums and debuts at No. 11 on the Internet sales chart. On the singles tallies, "Higher Medley" by Queen Latifah, Dolly, Keke Palmer, Jeremy Jordan, Angela Grovey, DeQuina Moore and Andy Karl holds steady at No. 1 gospel digital sales, No. 4 Christian digital sales and No. 4 Christian/gospel digital sales; "Man in the Mirror" by Palmer holds steady at No. 2 gospel digital sales and gains 12 to No. 7 Christian digital sales and No. 7 Christian/gospel digital sales; "Maybe I'm Amazed" by Jordan and Palmer holds steady at No. 3 gospel digital sales and rises 11 to No. 19 Christian digital sales and No. 19 Christian/gospel digital sales; "Here to the Moon and Back" by Dolly, Kris Kristofferson and Jeremy Jordan remains steady at No. 4 gospel digital sales and moves up 11 to No. 25 Christian digital sales and No. 25 Christian/gospel digital sales; "Fix Me Jesus" by Latifah gains one to No. 9 gospel digital sales; "That's The Way God Planned It" by Ivan Kelley Jr. shoots up 13 to at No. 12 gospel digital sales; and "He's Everything" by Dolly, Latifah, Palmer, Jordan, Karl and Moore holds steady at No. 15 gospel digital sales. The Little Willies' For The Good Times, with Norah Jones' cover of Dolly's "Jolene," falls 12 to No. 21 country in its second week, 53 places to No. 98 pop, 44 spots to No. 86 current albums, and two to No. 9 Internet sales while holding steady at No. 7 tastemakers and rising two to No. 4 Canadian country and 10 to No. 44 Canadian pop. Ladysmith Black Mambazo & Friends, with Dolly's cover of "Knockin' On Heaven's Door" with them, loses one to No. 3 world albums and 15 places to No. 29 gospel albums while falling off the 75-position Christian and gospel albums, dowm from its No. 10 debut, and off the 200-position current albums chart, down from its No. 149 debut. The Grascals' Country Classics With A Bluegrass Spin, featuring Dolly on three tracks, dips one to No. 10 in its 45th chart week, while Rhonda Vincent's Taken, featuring Dolly on one song, re-enters the 15-position bluegrass list at No. 11 for a 32nd week. Overall, Toby Keith's Clancy's Tavern rises two to No. 1 country and 14 places to No. 8 pop in its 13th week, while Lady Antebellum's Own The Night loses one to No. 2 country and holds steady at No. 17 pop in its 19th chart week. In related news, the Joyful Noise movie slipped two spots on Wednesday in the box office ratings behind The Iron Lady at No. 7 and Mission Impossible at No. 8, grossing $384,281 to come in at No. 9 and raise its cumulative total to $23.06 million. Well-known former prisoner of war Jessica Lynch was representing Dolly on Thursday before the state legislature in West Virginia. She has taken on the role of spokesperson for Dolly's Imagination Library literacy program in the state and was testifying before the House Finance Committee. Learn more from The Republic here. Also, check out a story on the program coming to Whitesburg, Ky., from WKYT here. The Joyful Noise Soundtrack doesn't make it into the top 10 this week, Billboard revealed Wednesday. When the new charts come out on Thursday the CD will rise nine places to No. 12 pop for selling just under 17,000 in its second week of release, matching the predictions reported here Tuesday from the preliminary building charts and representing a 23 percent sales increase. Also, the Joyful Noise movie regained the No. 7 box office spot on Tuesday, grossing $518,173 to raise its cumulative total to $22.7 million. Whether the Joyful Noise Soundtrack is going to break into the pop top 10 in its second week of sales will be a close call, preliminary numbers showed Tuesday. The weekly building charts, which don't include all retailers, placed the album at No. 12 for the week with about 16,500 copies sold. It is often off by one or two positions on several CDs in the top 50. We should know Wednesday when the top 10 is usually revealed, whether it will be in the top 10 or not. If not, we'll have to wait for the full chart on Thursday to know its position. Meanwhile, the Joyful Noise movie this week plays on the same 2,735 screens as its first two weekends and on Monday slipped to eighth place in box office grosses, with $408,418 in ticket sales falling just $28,000 below Mission Impossible. The final weekend actual ticket sales were released Monday as well, showing a $5.9 million gross compared to a $6.08 million estimate. Including Monday's take, the film is now at $22.15 million since release. Tuesday saw the U.S. release of the DVD of the Canadian film The Year Dolly Parton Was My Mom, which features several vintage 1970s clips of Dolly in addition to a present-day voice-over appearance in the movie. Get yours here! The Joyful Noise Soundtrack could be heading toward the Billboard top 10 albums when the new chart is released on Thursday, the magazine reported here over the weekend. Early sales data showed the album as the eighth-biggest selling title for the first four days of the chart week, last Monday through Thursday. It had previously sold 13,000 copies in its first week for a No. 21 debut. Its advance to the top 10 likely means second week sales in the 20,000-unit area. It would mark Dolly's just second album to reach the pop top 10, with the other being 1987's Trio, which made it to No. 6. In related news, the Joyful Noise movie slipped three spots for the weekend to rest at No. 7 with an estimated $6.08 million in ticket sales for a cumulative gross of $21.9 million. Given that the film cost an estimated $25 million to make and filmmakers receive almost all of the ticket sale proceeds, the film is close to turning a profit. Weekend estimates were $1.66 million and seventh place on Friday, $2.85 million and eighth place on Saturday and $1.57 million and seventh place on Sunday. It remained on the same number of screens, 2,735 nationwide, the third most of any film that played this weekend. Dolly's Better Day slips one this week on the British country music chart, it was announced Sunday. The CD lands at No. 7 country albums in its 21st week in the U.K., while Dolly: Live From London dips three to No. 18 country compilations in its 97th U.K chart week. Norah Jones' group, The Little Willies' For The Good Times, featuring a cover of Dolly's "Jolene," loses two to No. 3 country in the U.K. Down Under, The Very Best Of Dolly Parton, Volume 1 rises five to No. 7 Australian country in its 98th week and shoots up 30 places to No. 19 pop catalog albums in its 25th week there. One affiliate of Dolly's Imagination Library literacy program is seeing its participants score 15 percent higher on entering kindergarten literacy tests than those who did not receive her books, Ohio's Middletown Journal reported here over the weekend. 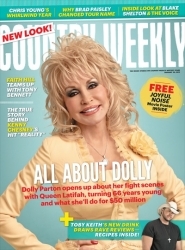 Dolly graces the new issue of Country Weekly magazine slated to be on newsstands nationwide Monday (although some stores put them out earlier). The edition dated Jan. 30 features a large picture of her on its front and the headline "All About Dolly: Dolly Parton opens up about her fight scenes with Queen Latifah, turning 66 years young and what she'll do for $50 million." Inside is also a movie poster of Joyful Noise, since that is the primary focus of the story. "I only take parts that I can do that are close to my personality because I don't know if I could play anything outside of my basic personality," Dolly explains in the interview, adding that the dancing she was required to perform proved the toughest challenge. "I was more nervous about that than anything," she says. Joyful Noise finished its first week of release Thursday with $15.83 million in box office ticket sales and a No. 4 placing for the seven-day period. It maintained its No. 4 place on both Wednesday and Thursday, grossing about $100,000 below Mission Impossible each night at $601,005 on Wednesday and $631,218 for Dolly's birthday. Four major new films opened Friday, so if Dolly's movie keeps attracting the same share of the total movie audience, it could remain in the bottom third of the top 10 this week. Dolly joined Music City's mayor, the governor of Tennessee and others on her 66th birthday Thursday to announce her theme park empire is expanding west to the state capital with a Nashville-based water and snow park operated by Dollywood. The yet-to-be-named attraction will start with a $50 million, 50-acre park cattycorner across the street from the Gaylord Opryland Hotel and Convention Center that will operate as a water park in warmer months and winter sports park with man-made snow in colder months. Image of Dolly with Gaylord Hotels Chairman and CEO Colin Reed is courtesy Gaylord Entertainment. Click on for larger version. Eventually, additional features will be added on the 114-acre property being developed as a 50-50 joint venue between Gaylord Entertainment, which owns the Opryland Hotel and Grand Ole Opry, and the Dollywood Company, Herschend Family Entertainment's partnership with Dolly that owns and operates Dollywood, Dollywood's Splash Country, Pigeon Forge and Branson's Dixie Stampede and Myrtle Beach's Pirate's Voyage. The first phase, the water and snow park, which is being billed as the first joint water and snow facility in the nation, is expected to host a groundbreaking late this year or early next year and open for business in summer 2014. Projections are for 450 employees and 500,000 guests during its first year of operation, compared to 4 million guests and more than 3,000 employees at the Dollywood Company's three Pigeon Forge businesses. "I'm so excited about this opportunity," Dolly said. "I am confident that partnering my Dollywood Company with a great company like Gaylord will create something truly special. We're all working on new types of entertainment to do in the daytime and nighttime for the whole family so we bring new folks to the area year round." From left, Craig Ross of Dollywood, Nashville Mayor Karl Dean, Tennessee Gov. 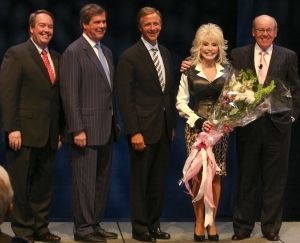 Bill Haslam, Dolly and Colin Reed of Gaylord Entertainment. Image courtesy Gaylord Entertainment. Click on for a larger version. The partnership is a bit ironic, since competition from Dollywood was cited as one of the reasons for the closure of Gaylord's Opryland theme park in 1997, which was converted into a mall in 2000. Of course, Dolly also has ties to Gaylord as a member of its Grand Ole Opry and the millennium New Year's concert headliner at the Opryland Hotel in 2000. In addition, during her tenure on The Porter Wagoner Show, the program became first television show to be broadcast from Opryland when it moved to the property shortly after the theme park opened in 1972. The land for the new development was rezoned in 2007 for a "commercial attraction," which started rumors that a new theme park was coming. "Tourism is the second largest industry in Tennessee, generating more than a billion dollars in tax revenue annually and employing more than 170,000 Tennesseans," Gov. Bill Haslam said. "This project will be a welcome addition to the wide variety of attractions and destinations across our great state, and I applaud the collaboration and spirit that has led to this announcement." "Music City has become a travel destination unlike any other in the country," Nashville Mayor Karl Dean said. "The addition of this family entertainment complex near Opryland adds a critical missing piece to our tourist offerings. It provides a unique leisure attraction that will further enhance our already booming hospitality industry, which is one of our city's top private sector employers." 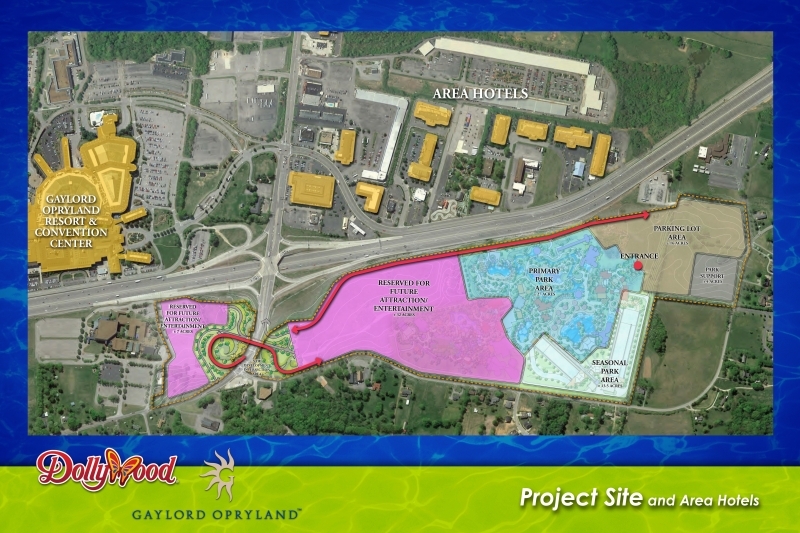 According to The Wall Street Journal here, this will be the third water park tied to a Gaylord mega-hotel, with two others being in Ft. Worth, Texas, and Orlando, Fla. It will be the second Herschend property with man-made snow, having already brought the technology to Georgia at its Stone Mountain Park. Site plan for the new water and snow park. Click on it for a larger view. Additional coverage is available from The Tennessean here, News Channel 5 here, Nashville Business Journal here, Knoxville News Sentinel here and CNN here with an interview also available in the media player below. As was expected, the Joyful Noise Soundtrack makes a huge impact on the Jan. 28 Billboard charts released Thursday. The album debuts at No. 1 soundtrack albums and gospel albums; No. 2 Christian albums, Christian and gospel albums and independent label albums; No. 11 digital album sales, No. 20 current pop albums and No. 21 overall all-genre pop albums. Eight tracks from the project show up on various spiritual charts as well for the week. "Higher Medley," billed as Queen Latifah, Dolly, Keke Palmer, Jeremy Jordan, Angela Grovey, DeQuina Moore and Andy Karl debuts at No. 1 gospel digital sales, No. 4 Christian digital sales and No. 4 Christian/gospel digital sales; "Man in the Mirror" by Palmer debuts at No. 2 gospel digital sales, No. 19 Christian digital sales and No. 19 Christian/gospel digital sales; "Maybe I'm Amazed" by Jordan and Palmer debuts at No. 3 gospel digital sales, No. 30 Christian digital sales and No. 30 Christian/gospel digital sales; "Here to the Moon and Back" by Dolly, Kris Kristofferson and Jeremy Jordan debuts at No. 4 gospel digital sales, No. 36 Christian digital sales and No. 36 Christian/gospel digital sales; "Fix Me Jesus" by Latifah debuts at No. 10 gospel digital sales; "He's Everything" by Dolly, Latifah, Palmer, Jordan, Karl and Moore debuts at No. 15 gospel digital sales; and "That's The Way God Planned It" by Ivan Kelley Jr. debuts at No. 25 gospel digital sales. Two other new Dolly-related projects also impact the charts this week for the first time. The Little Willies' For The Good Times, featuring Norah Jones' cover of Dolly's "Jolene," debuts at No. 9 country, No. 45 pop, No. 42 current albums, No. 7 Internet sales, No. 7 tastemakers, No. 6 Canadian country and No. 54 Canadian pop. Ladysmith Black Mambazo & Friends, featuring Dolly's lead vocals on a reggae version of "Knockin' On Heaven's Door" with Bonnie Raitt on slide guitar, debuts at No. 2 world albums, No. 4 gospel albums, No. 10 Christian and gospel albums and No. 149 current albums. Elsewhere on the charts, The Grascals' Country Classics With A Bluegrass Spin, with Dolly on three songs, rises five places to No. 9 in its 44th chart week, while Rhonda Vincent's Taken, with Dolly on one track, falls back off the 15-position bluegrass list, down from No. 12 last week, its 31st. Overall, Lady Antebellum's Own The Night remains at No. 1 country but drops five to No. 17 pop in its 18th chart week, while Luke Bryan's Tailgates and Tanlines rises one to No. 2 country and No. 18 pop in its 23rd week. Dolly's Imagination Library literacy program sees some coverage in the media this week. In addition to discussing the program on Anderson, Anderson Cooper's daytime talk show, on Thursday, the free book program in Charlotte County, Fla., made The Herald Tribune here and in Staunton, Va., made The News Leader here. Sixty-six years ago Thursday, Dolly Rebecca Parton was born in the Great Smoky Mountains of East Tennessee. We wish her the happiest of birthdays. Check out birthday wishes from the Joyful Noise promotional choir via YouTube in the media player above or by clicking here. The Joyful Noise Soundtrack will top the soundtrack albums list and gospel albums tally when the official Billboard charts are released Thursday, a press release issued Wednesday noted. In addition, the CD will be No. 2 independent label albums and No. 2 Christian albums as well as debuting in the top 20 pop albums list, as was predicted here based on preliminary sales data. In related news, Dolly was interviewed on NPR's Tell Me More program Wednesday. Take a listen here. Dolly and the film's music supervisor Mervyn Warren will be featured on Sirius XM's The Bob Edwards Show Friday, and Dolly's Jan. 11 appearance on The Late Show With David Letterman will repeat on CBS Jan. 27. Finally, the film retained its No. 4 position on Tuesday with a box office gross of about $800,000 (behind Contraband at $2.2 million, Beauty and the Beast 3D at $1 million and Mission Impossible at about $900,000). Dolly's movie Joyful Noise recaptured the No. 3 position on Martin Luther King Jr. Day Monday, according to estimated grosses, but the $30,000 difference between its $2.53 million haul at No. 3 and Mission Impossible at No. 4 wasn't enough to cover the difference between the two films on Saturday and Sunday, so Dolly's film finished the four-day weekend at No. 4. The top four for the holiday weekend, according to estimated grosses, were Contraband at $28.8 million, Beauty And The Beast 3D at $23.5 million, Mission Impossible with $14.2 million and Joyful Noise with $13.8 million. However, Warner Brothers executive vice president Jeff Goldstein told The Hollywood Reporter here that it was "absolutely in the range of what we were looking for" and added that it played much better in several areas of the South, most notably Texas, Florida and Mississippi. ABC News gave a mostly positive review of the movie here, and The Wendy Williams Show has booked Queen Latifah for Wednesday's episode to promote the film. Finally, the soundtrack, available here, seems to be doing very well if online sales are any indication. The album has steadily seen sales increase since the movie hit theatres Friday, and by Monday it was the No. 2 best-seller on Amazon.com and the No. 3 best-seller on iTunes. Although Dolly's new film Joyful Noise opened as the country's No. 3 film on Friday, it slipped to No. 4 for the full regular weekend but might recapture the No. 3 spot once Monday's holiday numbers are added in, observers say. On Friday, Contraband opened with $8.7 million, Beauty and the Beast 3D next with $5.6 million and Joyful Noise with $3.32 million. (All numbers are estimates until the actuals are released Monday afternoon -- below them were Mission Impossible with $3.27 million and The Devil Inside at $2.7 million.) Noise dropped to fourth on Saturday with $4.6 million and stayed there Sunday with $3.4 million, giving an overall line-up change for the full three days. Contraband stayed on top with $24.1 million and Beauty behind with $18.5 million. Mission Impossible made it to No. 3 with $11.5 million, followed by Noise at fourth just $155,000 lower at about $11.4 million. (Sherlock Holmes advanced past Devil to take fifth place with $8.4 million). However, since it is a holiday weekend, the industry will focus more on the four-day total than the three-day weekend, and the battle for third and fourth places is so close, the film could go back to No. 3. In fact, The Hollywood Reporter predicts here that the picture will do just that. It expects the four-day line-up to be Contraband with $28.4 million, Beauty with $24.7 million, Noise with between $14 million and $14.5 million, and Mission Impossible close behind with $14 million. Dolly and Joyful Noise co-star Queen Latifah made several unannounced additional appearances over the weekend to promote the film. One of the more interesting was seeing the pair on Black Entertainment Television (BET), presumably Dolly's first appearance on the network. They stopped by the countdown program 106 & Park on Friday, where they had a brief interview and Dolly even rapped while Latifah beat-boxed. Check out the appearance here. Thanks, Tony! Dolly stopped by NBC's Today again on Sunday, having previously been on the program just three days prior. See that second appearance here. And on Friday night, they made an unannounced stop by Late Night with Jimmy Fallon on NBC to participate in a game of charades with the host and his sidekick. Watch that skit here or in two parts in the media players above and below. In addition, it was announced over the weekend that Dolly will be Thursday's guest on Anderson Cooper's syndicated morning talk show, Anderson. Check your local listings for broadcast times and stations. The interview has already been taped; check out a preview here. Dolly's Better Day is still in the top 10 on the British country music chart, it was revealed Sunday. The title holds steady at No. 6 country albums in its 20th week in the U.K., while Dolly: Live From London loses three to No. 15 country compilations in its 96th U.K chart week. Norah Jones' group, The Little Willies, see their For The Good Times, with their cover of Dolly's "Jolene," debut at No. 1 country in the U.K., but it didn't sell enough copies in its first week to make the top 100 pop list there. Down Under, The Very Best Of Dolly Parton, Volume 1 drops five to No. 12 Australian country in its 97th week and dips 10 to No. 49 pop catalog albums in its 24th week there, while The Essential Dolly Parton falls off the 20-position country tally, down from No. 18 in its eighth chart week. Industry observers after Friday's initial grosses seem to agree that Dolly's film Joyful Noise will likely take the No. 3 spot with a respectable debut. According to Variety here, Contraband took in between $6 million and $7 million on Friday while Beauty And The Beast 3D and Joyful Noise were close behind with between $4 million and $6 million each. However, the publication predicts that by the end of the four-day weekend the break-down should be Contraband at $25 million, Beauty at $22 million and Noise at $17 million. They think Mission Impossible will take fourth place and The Devil Inside fifth. The Hollywood Reporter crunched similar numbers, projecting here that Contraband would take in between $24 million and $25 million, Beauty between $20 million and $22 million and Noise between $16 million and $17 million. Could Dolly have the nation's No. 1 movie over the long Martin Luther King Jr. weekend? Observers are split over whether that will happen with Friday's release of her film Joyful Noise (opening in 2,735 theatres), the 3-D re-issue of Disney's Beauty and the Beast (opening in 2,625 theatres) and the opening of Mark Wahlburg project Contraband (in 2,863 theatres). The Associated Press predicts here that Joyful Noise will take the No. 1 spot with $20 million in ticket sales, followed by Contraband in second place and Beauty in third, both scoring in the high teens, with Mission Impossible taking the fourth place in mid-teens and The Devil Inside fifth place at around $10 million. At the other end of the spectrum, RTT News here thinks Dolly's picture will flop and only take in $8 million in its first weekend for a fifth place finish (with Beauty on top at $23 million, Contraband second at $16.5 million, The Devil Inside at third with $15 million and Mission Impossible fourth at $12 million). Box Office Mojo also predicts here that Noise will be in fifth place but gives it a bigger draw, $12.6 million, with Beauty at No. 1 with $19.6 million, Contraband next with $18.5 million, Mission Impossible at $16 million and The Devil Inside at $14 million. It also reports that the film cost $25 million to make and should be successful if its first week take is anywhere in excess of $10 million. Meanwhile, The Hollywood Reporter cites here that box office observers think the three new films will take the top three spots with conservative projections of between $15 million and $18 million each, but noted that most are waiting to see what Friday's afternoon matinee grosses are before guessing which will be No. 1 for the weekend. With the movie opening, there are tons of interviews and reviews making the rounds. Check out Dolly and Queen Latifah's Today performance of "Not Enough" in the media player below and their interview in the media player above, or visit MSNBC here to watch. A CMT interview with Dolly is here, and Reuters has video from the premiere here. WBIR focused on some extras here, while interviews appeared on She Knows here, Wave Newspapers here, Patheos here, FOX All Access here and FOX News here. Jezebel looked at how it's impossible to criticize Dolly's style here and an interview with Knoxville News Sentinel columnist Terry Morrow reveals that Dolly will take 2012 off from the road to focus on finishing writing her musical autobiography for the stage. "It'll be a year of writing and developing," she told him, "and that's enough to keep me busy." Read more here. A sampling of reviews includes Monsters & Critics here, The Huffington Post here, Chicago's Daily Herald (which absolutely hated the film) here, Milwaukee Journal Sentinel (which called Dolly "as engaging as ever") here, Movie Line here, Minneapolis Star Tribune (which loved Dolly in the movie and said "the film is good-natured cornpone, insistently affirmative and uplifting, but not so pushy you feel that the emotions are being coerced . . . rapturous fun.") here, The Salt Lake Tribune here, New York Times here, Canada's National Post here, Reuters here, USA Today here, E! Online here (a "B-minus"), St. Louis Today here (which found Dolly "distracting"), New York Daily News here, US Magazine here, Windy City News here, LA Weekly here, The Seattle Times here and Film Journal here. One the best reviews came from Time magazine here, with its reviewer saying that even though the movie is textbook horrible and does everything critics hate, it's a wonderfully enjoyable movie that audiences will love, "a giddy, guilty pleasure." Its critic also loved Dolly in the film and her songwriting. The movie isn't the only Dolly-related opening on Friday. Her flagship Dixie Stampede dinner theatre in Pigeon Forge, Tenn., also opens for its new season and will begin the year-long celebration of its 25th anniversary. Special prizes will be awarded to the year's 25th, 250th, 2,500th, and 25,000th guests. In addition, a grand prize give-away will be awarded the venue's 250,000th guest. "I've always said that time flies when you're having fun, and that truly applies to my Dixie Stampede," Dolly said in a press release. "Over the years, some incredibly talented performers, those with two legs and those with four legs, have thoroughly amazed audiences with their talents, and our 25th anniversary season will be no exception!" Dolly and Kenny Rogers' 1984 collection Once Upon A Christmas falls off its final chart of the year this week, dropping off the top 50 Canadian country albums list, down from No. 36 in its 10th week on that chart this holiday season. In the U.S., the Jan. 21 Billboard numbers show The Grascals' Country Classics With A Bluegrass Spin, featuring Dolly on three songs, holding steady at No. 14 in its 43rd chart week, while Rhonda Vincent's Taken, with Dolly on one track, re-enters the bluegrass list at No. 12 for a 31st week. Overall, Lady Antebellum's Own The Night remains at No. 1 country but falls eight to No. 12 pop in its 17th chart week, while Toby Keith's Clancy's Tavern regains three to No. 2 country and 18 places to No. 14 pop in its 11th week. Coverage was all over the web on Tuesday from Monday night's world premiere of Dolly's film Joyful Noise. The Huffington Post interviewed Dolly and co-star Queen Latifah here. Stories and photos and videos also appeared in The Los Angeles Times here, OK Magazine here, ACE Showbiz here and the Associated Press here. Fan video from the premiere is available on YouTube from Joshua Skidmore here and a story on IndieWire here. I'm told that Dolly spent about 45 minutes on the carpet visiting with the press and some members of the public got tickets when they were released prior to the screening (which, I'm told, was Dolly's first time to see the movie herself!). She told E! Online from the red (or black) carpet here that she still wants to duet with Lady Gaga and told CNN here she still wants Kristen Chenoweth to play her in the Broadway musical she is writing about her life story (Chenoweth responded to Access Hollywood here that she still wants to do it "but she better freakin' hurry up and write it.") CMT.com posted a clip on the song "From The Moon And Back" viewable in the media player above or by clicking here (and also added the movie coverage to this weekend's CMT Insider). Britain's The Daily Mail here noted what appeared to be a new flower tattoo between Dolly's breasts. And reviews came from Kansas City Star here ("the big screen equivalent of a sloppy smooch from your over-affectionate aunt over the holidays. You grimace. You stand there and take it. And you don't let anybody see you grin afterward. "), The Arizona Reporter here ("Yet despite its Hallmark Hall-of-Fame qualities, the performers are appealing, the music is inspiring, and the food fight in a restaurant between two rivals in the choir are enough to make Joyful Noise a welcome addition to the generally bleak and all-too-adolescent January fare.") and The Associated Press (via the The San Francisco Chronicle) here ("If some incarnation of "Glee" were to be developed for the Christian Broadcasting Network, it would probably look a lot like Joyful Noise.") The Joyful Noise Soundtrack hit stores Tuesday, and Dolly begins her major television program rounds on Wednesday night on CBS' The Late Show With David Letterman. The 25th anniversary of Dolly's classic Trio album with Linda Ronstadt and Emmylou Harris will be celebrated with a boxed set release on a yet-to-be-announced date later this year, Billboard magazine announced online here Tuesday. The boxed set will include both the 1987 original album and its 1999 follow-up Trio II in addition to previously unreleased bonus tracks from session outtakes that Harris told the magazine "might be a real nice surprise for people." Monday was the big night in Hollywood with Dolly, Queen Latifah and the other stars of Joyful Noise walking the red carpet at the picture's premiere. They also did several interviews, including taping the appearance on Extra viewable here or in the media player above and Cinemax's 60 Seconds With featuring Latifah interviewing Dolly here or in the media player below (see Dolly interview Latifah in an episode here). There's also an appearance on Entertainment Tonight here from Monday and print interviews of the two ladies with The New York Daily News here and with co-star Angela Grovey in Houston Culture Map here. In addition, Dolly has been added as a guest on Friday's Access Hollywood. '9 To 5' Heading To U.K.
A "new" version of Dolly's 9 To 5: The Musical is heading to Great Britain, What's On Stage reported here Monday. Howard Panter, joint CEO of Ambassador Theatre Group, confirmed to the publication that his firm is working on the production. He did not disclose whether the new show would play London's West End (its equivalent of Broadway) or tour in the company's group of theaters. Dolly's projects on the charts overseas see mixed results this week. Down Under, The Very Best Of Dolly Parton, Volume 1 gains three to No. 7 country in its 96th chart week but falls two to No. 39 pop catalog albums in its 23rd week on that list while The Essential Dolly Parton slips one to No. 18 country in its eighth chart week. In the U.K., Better Day loses two to No. 6 country albums in its 19th chart week on the British charts, while Dolly: Live From London falls five to No. 12 country compilations in its 95th U.K chart week. The big onslaught of media coverage for the Dolly and Queen Latifah movie Joyful Noise approaches with the previously-announced world premiere in Hollywood on Monday night prior to the two lead actresses appearing on numerous television programs to promote the film. Print interviews continue as well, with a Dolly interview in The Boston Herald here and V magazine here, Dolly and Latifah in The Toronto Sun here and Keke Palmer here. Knoxville News-Sentinel columnist Terry Morrow says NBC entertainment head Robert Greenblatt wants the network to work with Dolly, although he isn't quite sure what project yet or whether she'd be free to do it. Read more here. Baltimore Net Radio is dedicating three hours of its live streaming programming Jan. 22 to celebrate Dolly and her career, the station has announced. The program kicks off at 3 p.m. Eastern and features music, birthday wishes from fans (USA call toll-free 877-577-2630 option 5;�international callers may call 540-288-4001, option 5, or e-mail dolly@baltimorenetradio.com) and a new interview with her that will be taped Monday. Check out a YouTube promotional video on the special here. Ladysmith Black Mambazo's "stand out" collaboration from the band's storied career was its work with Dolly, one of its main performers said in advance of the release of Ladysmith Black Mambazo & Friends Tuesday. Read more in a story from The Chicago Sun Times here. With their cover of "Knockin' On Heaven's Door," the CD is one of three Dolly-related projects hitting shelves Tuesday, as it also sees the release of the Joyful Noise Soundtrack and the Norah Jones project For The Good Times with The Little Willies featuring her cover of "Jolene." More footage from Joyful Noise continues to hit the web, with an exclusive preview that includes behind-the-scenes footage during the movie's filming and interview clips with the stars courtesy iVillage here and in the media player above. The film's first reviews started to come out Thursday, with both Variety and Hollywood Reporter offering mixed opinions, noting it's formulaic and predictable. Even so, Variety said here that "the starry fireworks show should inspire a mix of black and heartland believers," that the food fight scene is "deliciously over the top," and that Dolly and Latifah are the project's "saving grace." The Hollywood Reporter opined here that is was like Sister Act 3 and summed it up as "lively music can't hide the corn." NBC's Today show announced Thursday that Dolly's previously-announced appearance next Thursday to plug the project will also feature co-star Queen Latifah and take place sometime during the program's first two hours. Latifah was featured in an interview Thursday night on ABC's Nightline, a summary of which is available here. Dolly interviews appeared in The Columbus Dispatch here and Toronto.com here, while she and Latifah spoke with Straight.com here. Movieweb announced a contest to win the soundtrack (which comes out on Tuesday and is available for pre-order here) and a Sony Desktop Player here. And AOL's The Boot offered the food fight scene with interviews here and in the media player below. Kenny Rogers and Dolly's 1984 holiday collection Once Upon A Christmas has finished its annual American chart run for the season, the Jan. 14 numbers released Thursday confirmed. The CD falls off the 25 position country catalog albums tally, down from No. 15 last week, its eighth this season and 73rd since release, and it also drops off the 50-position holiday albums list, down from No. 47 last week, its 40th since release. In Canada, the album falls off the top 100 pop chart and drops 30 spots to No. 36 country albums in its 10th chart week this year. Chicago's O Christmas Three, featuring a Dolly appearance, falls off the 50-position independent albums chart, down from No. 19 in its seventh week there. The Grascals' Country Classics With A Bluegrass Spin, with Dolly on three tracks, re-enters the 15-position bluegrass albums chart at No. 14 in its 42nd week. Overall, Lady Antebellum's Own The Night holds steady at No. 1 country and gains two to No. 4 pop in its 16th chart week, while Scotty McCreery's Clear As Day remains at No. 2 country and loses seven to No. 18 pop in its 13th chart week. According to All Access here, Dolly is among this year's inductees for The Hit Parade Hall of Fame alongside Harry Belafonte, The Crewcuts, The Doobie Brothers, Duane Eddy, Percy Faith, Ferrante & Teicher, Al Green, Tony Orlando & Dawn, The Osmonds with Donnie and Marie, The Pointer Sisters and Bruce Springsteen. Bridesmaids star Ellie Kemper is seeking Dolly to sing at her upcoming wedding, she revealed on Ellen this week. Check out footage via YouTube here and read a story on Contact Music here. Several brief scenes from Dolly's upcoming movie Joyful Noise have been posted to Upcoming Movies.com here, including a moving clip from her song "From Here To The Moon" in a flashback or fantasy scene with Kris Kristofferson as her late husband viewable in the media player above or by clicking here. Dolly also appears in a clip with her pastor here and at the end of a clip where her grandson asks to join the choir here. The site also features several interviews with crew members from the film. In addition, a longer version of the food fight scene with co-star Queen Latifah has been posted to She Knows here and is viewable in the media player below. Dolly has also been added as a guest to the Jan. 11 episode of The Late Show With David Letterman on CBS to promote the film. As was previously reported here, she will also appear Jan. 12 on NBC's Today and ABC's Live With Kelly. Dolly's Better Day CD has made its first and perhaps only best-of-the-year list, being included in the top 10 albums of 2011 by NPR's Fresh Air music critic Ken Tucker. He placed the collection at No. 8, opining: "A call for optimism during hard economic times, sung with full-throated conviction." Check out the piece in written form and audio format on NPR's website here. Thanks, Frank! Dolly's 66th birthday will be celebrated by New York gay comedy group International Order of Sodomites' (I.O.S.) monthly comic variety show "The Meeting," Broadway World reported here Wednesday. Each monthly show honors a different gay icon, and the Jan. 19 edition recognizes Dolly. The show takes place at 9:30 p.m. at The Duplex, Christopher Street at 7th Avenue in New York, with a $10 cover charge and two-drink minimum. In addition to being North America's first wing coaster, Dollywood's Wild Eagle will also boast the nation's largest flying eagle steel sculpture, it has been announced. The statue will weigh more than four tons and have a wingspan equal to the height of a four-story building. Check out a video about the addition on YouTube here. The closer the opening date for Dolly's Joyful Noise film gets, the more promotions come out to get word out about the picture. Dolly and co-star Queen Latifah were interviewed by Canada's National Post here, while Dolly also chatted with AOL's The Boot here. Some quotes from Latifah made a story on Contact Music here, while another interview with her was on The Skanner here. An interview with co-star Jeremy Jordan, who plays Dolly's grandson, is available on YouTube here, while EurWeb is offering a pair of tickets to next week's premiere (enter by Wednesday here), and Entertainment Weekly gave a brief synopsis preview here. Dolly's "The Sacrifice" single is up against a Brantley Gilbert song for Taste Of Country's "showdown." Vote for her number here. NPR has posted a preview of all of the songs on For The Good Times, the new album by Norah Jones' side project The Little Willies, including their cover of Dolly's classic "Jolene." Take a listen here, and reserve your copy of the album, hitting stores next Tuesday, here. Dolly's overseas chart performance continues to drop following the end of her world tour. Down Under, Better Day falls off of the 20-position Australian country albums chart, down from No. 20 country in its 13th week. Her other two titles on the tallies there stick around another week: with The Very Best Of Dolly Parton, Volume 1 losing three to No. 10 country in its 95th chart week and 17 places to No. 37 pop catalog albums in its 22nd week on that chart and The Essential Dolly Parton inching down one to No. 17 country in its seventh chart week and falling off the 50-position pop catalog albums chart, down from No. 50. In the U.K., Better Day loses one spot to No. 4 country albums in its 18th chart week on the British charts, while Dolly: Live From London gains a dozen digits to No. 7 country compilations in its 94th U.K chart week. Promotions continue to line up for Dolly's film Joyful Noise, with an appearance scheduled over the weekend for the Jan. 12 episode of NBC's Today program the morning before the film opens nationwide. In addition, check out a mini-review from The Philadelphia Inquirer here that says the plot is predictable but the soundtrack amazing and a preview on Playbill.com here.